100 Year Old Weblog: April 9, 1916 SAYS 'HELLO' GIRLS MAKE GOOD WIVES. April 9, 1916 SAYS 'HELLO' GIRLS MAKE GOOD WIVES. SAYS 'HELLO' GIRLS MAKE GOOD WIVES. Miss Eagan, Chief at Bell Co., Tells How Few Fail to Wed.
16 IS AGE TO START. Company Treats Empolyes Well and Seldom Discharges Anyone. After twenty years of employing and supervising "hello" girls, Miss Katie Eagan has reached the conclusion that she obtains the best results for her comp;any if she tries to train them to be good wives. Miss Eagan was the guest of honor the other night at a banquet given to commemorate the twentieth anniversary of her first service with the Bell Telephone Company. She is chief operator at the main exchange, a place she has held for thirteen years. For four years she was chief operator at the Grand exchange, and for two years at the South exchange. Until recently she personally employed all of the Bell's central girls. Her other duties have multiplied until now she no longer employs the girls, but after they have passed th rough the school the become her charges. "Why not train the girls to be good wives?" Miss Egan said last night. "The average term of service is thirty-three months, and nearly all of our operators leave to be married. It is my life ambition now so to mold the girls at the switchboard that no man who marries one will be disappointed. "I much prefer young girls. Sixteen is the best age for a girl to begin as an operator. She has been used to going to school and she does not think our efforts to instruct her in her work are nagging. She learns quickly, because she has been in the habit of studying and knows how to apply her mind, and she remains with us several years after she has become competent. Eighteen is a little too old, because a girl who comes to us at that age is apt to get married so soon it scarcely is worth while to train her. When a new operator who is as old as 23 enters our employ I know that she will be very difficult to teach, unless she is an exceptional girl." Miss Eagan declared that her twenty years will the Bell company have shown her that much of the criticism of corporations as being "soulless" is unfounded. "No concern could treat its employes better," she said. "It is very rarely that an operator is discharged and our whole attention is centered to making them efficient and holding their services. The company has now instituted a system of sick and death benefits, which is entirely without charge. formerly we would lose many girls who enter the services of some large business house to operate a private branch exchange. But that sort of raids on our ranks has almost ceased to be successful. The girls learned that elsewhere they were likely to lose their places because some head of a department happened to be in a bad temper, while here their places were secure as long as they did their work. 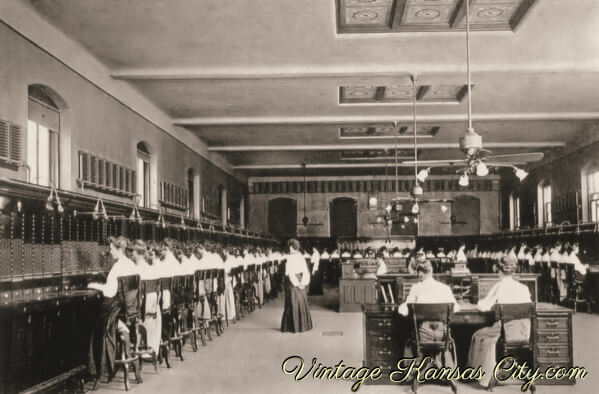 At the old South exchange, Miss Eagan was the night operator. Her mother would go into the office with her, and when the daughter slept Mrs. Eagan would listen for calls. "Listen is the correct word," said Miss Eagan. "For in those days the boards were so arranged that at night a bell would ring when a call came in." "Instead of showing a light on the board, a call would then cause a hinged metal plate to drop down. sometimes the drops would stick, and if we heard a slight buzzing we would have to try all of our numbers until we came to the right one." The new boards have added greatly to the efficiency of the telephone, Miss Eagan said. She declared that operators now are assigned according to the number of calls and not merely given a certain number of lines to watch, as was the former custom. "Being an operator is the nicest work a girl can do," said Miss Eagan. "I have always liked it. Sometimes the mother of a girl will tell me that the work is wearing her out. But that is not true. If a girl will try not to be to active socially, and will keep regular hours and get enough sleep the work will make her more alert, mentally and physically, and will be good for her."